Napping on the couch is disgusting. The hubs and I are in a stand-off. The time has come for a new couch and after months of couch-shopping, we're in a deadlock. He wants a big, poofy sectional so he can take naps and disappear into the furniture when I ask him to do things. And I want a stylie, prim and proper settee with thorns. Why do I want my furniture to play offense? To discourage nap-taking on the sofa. It's disgusting. Besides, why would you want to put your face where butts have spent countless hours? Maybe someone rode the city bus and sat in a dried puddle of urine and then came over for a visit on that couch. Maybe a lactose intolerant person ate buttered popcorn while watching a movie. You can't know the history, even a brand new couch in your own home. It is impossible. So why would you want to put your face there and relax into a slumber? Oh, I could do this all day. I have ideas for everything. Like, I think eating in the car should be sanctioned by all. Lots of people think that's a big, gross "don't" but as far as I'm concerned, you just spilled crumbs where no one will ever put their face. Seriously, have you ever seen a baby crawl on the floor of a car? Doesn't happen! So I say spill all the crap there you want. And while I'm on the topic of what is gross and what is not, let's get in the habit of cranking an extra paper towel down for the next person in public restrooms. That has been my mini-contribution to society for ten years but I have yet to see anyone leave a cranked towel for me. Allow me this legacy! Speaking of cranky, it's time for my nap. In a bed. Eeeeuuuuuu! I never thought of that! Too funny! But now that you have seen my side of things it cannot be unseen. Do I get a vote? Big. Poofy. Sectional. Jimmy, this is not about hockey! Not everything is about watching hockey! God. Men. All alike. That stylie, prim one would break at least 6 Man-Rules. beautiful and slightly stand-offish? Those are my rules and they work just fine. Is the pretty couch comfortable? Don't you spend a lot of time sitting there? I think function first, looks second. I'm German. Pain does not bother me. You can't know the history, even a brand new couch in your own home. It is impossible. Get a big poofy leather sectional. Leather wipes down easily and is relatively kid-proof (so long as they stay away from it with ballpoint pens and sharp objects). You can nap on it all you want and just use leather cleaner once or twice a week on it. Wait. You're vegetarian. Does that extend to a ban on leather in your house? In that case, scratch my last comment. I don't think we're leather couch people, but I hadn't put my finger on why. That's it! No offense to other people and what they want to do, but *I* can't have a giant animal carcus in my living room. Thank you for helping me think! What's funny is we had it all settled until the white settee with thorns didn't arrive on time and the store had to send us "loaner" furniture. Now we're like, "hey, this ugly stuff is really comfortable!" So we're living with this kinda ugg furniture until we make a decision. I should post pics. Yes, to napping on the sofa! 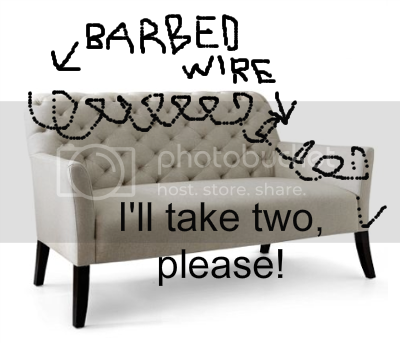 Save your gorgeous white sofa for the next house when you have the roped off room to put it in. You have two small (beautiful) girls who are going to jump, draw all over and puke (my son did this last week on our 8 month old sofa) on your sofa. Save yourself the grief and stress and get something that's cleanable, comfortable and cozy! Oh and while your at it get a sofa sleeper for the MIL! BTW, there are way cute sectional sofas out there that don't look like they belong in a rec room or basement. Just my two scents! Love ya! In case anyone wanted an update on this, "big ugly sectional" won by a slim margin. That is to say my husband pulled his weight. He may have won this time, but please note this is headed straight for the basement once we get a bigger house, at which time it will be Thorned Setee all day long. Carry on, Chicago.